The latest athlete to join the ranks of Jewish ballplayers is a 6-foot-4-inch first baseman with prodigious power and a promising future with the Toronto Blue Jays. 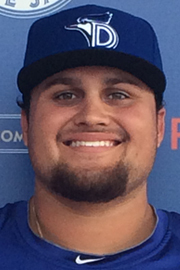 California native Rowdy Tellez, 21, turned down a roster spot at USC in 2013 when the Blue Jays offered him an $850,000 signing bonus out of Elk Grove High School, an eye-popping figure for a 30th-round draft pick. In its pre-draft scouting report, Baseball America had called Tellez the “best lefthanded power bat” in the 2013 class with a “patient approach at the plate and excellent hand-eye coordination.” A year earlier, he’d won the Perfect Game National Showcase home run derby. It appears Toronto’s talent spotters knew what they were doing. Except for a rough start in rookie-league ball, Tellez has paid off for the Jays, shaking off injuries to earn a spot in the prestigious Arizona Fall League in 2015, reach #9 on MLB.com’s list of Toronto’s top minor-league prospects in 2016 (see video), and earn an invitation to the Blue Jays’ 2017 major-league Spring Training camp in Dunedin, FL. Tellez’s 2016 season was his finest yet. Playing for the New Hampshire Fisher Cats (AA), the son of Lori Bernick Tellez and Greg Tellez hit .297 with 23 home runs (tied for 4th most in the Eastern League), 81 RBIs (5th), a .387 on-base percentage (2nd), .530 slugging percentage (3rd), and .917 OPS (3rd). Tellez is not alone on the farm. Other Jewish prospects in the Toronto system include OF Jake Thomas, P Jake Fishman, and C Ryan Gold. And of course, at the Major League level there’s Superman himself, star centerfielder Kevin Pillar. Please join us in welcoming Rowdy to the family, and follow him on Twitter.